When I was a young comics-reading lad, I always liked Batman. Superman never really appealed to me because he was too… well… super. I mean, the guy could fly so fast he could travel through time, and so strong he could carry a planet out of its orbit. Who can identify with someone who can basically do anything he wants? Batman, on the other hand, was just a really smart guy with lots of cool toys. He wasn’t inhumanly strong or fast, and he couldn’t fly. He was, however, the world’s greatest detective, and a supremely well-trained athlete — like Sherlock Holmes and a pre-plastic-surgery Bruce Jenner rolled into one. Or, to put it another way, he was Iron Man, without the armor, but with a host of other gadgets to accomplish most of the same tasks. Then along came Frank Miller. Frank Miller — a tremendously talented cartoonist (that’s the technical term for a comics creator who who both writes and draws, regardless of whether the material is comedic or dramatic), by the way — holds the unique distinction of single-handedly ruining two of my favorite superheroes — Batman and Daredevil. He did this by making both characters dark and hyper-violent, to the point of psychopathy: Batman, in Miller’s landmark 1986 miniseries The Dark Knight Returns; Daredevil, in Miller’s lengthy run (1979-1983) as first artist, then writer-artist, on the character’s eponymous series. Ironically, it was Denny O’Neil, whose Batman stories I so admired, who hired Miller for both jobs, in his capacity as editor, first at Marvel, then later at DC. Don’t get me wrong. I don’t oppose Batman being what he was originally intended to be — the grim avenger of the night. Let’s face it, he dresses in a bat costume for a reason. But Miller’s perspective robbed Batman of the features that made him so fascinating — his brilliant intellect; his investigative skills; his technical wizardry — and turned him into a thug in a bat suit. Someone could create great comics about a thug in a bat suit — in fact, Frank Miller did. 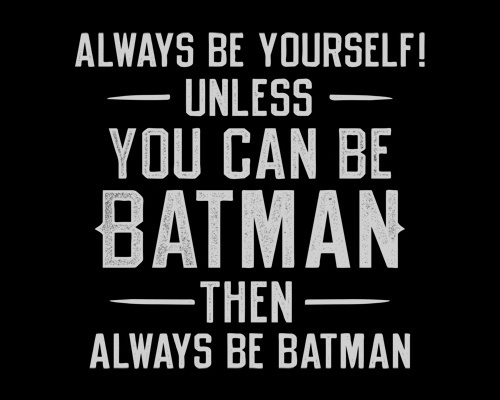 But that character isn’t Batman. At least, not the Batman of whom I was once so enamored. Some historian might well note that when Batman first appeared in comics in 1939, he was a much darker character. In his earliest issues, Batman even carried a handgun — and used it, frequently. (The same could be said of a number of Golden Age heroes; the Spectre, for example, took eerie delight in killing off evildoers using grotesque, often graphic, methods.) So, true enough. But the Caped Crusader evolved away from that initial “gunslinging vigilante” image fairly quickly, just as Superman evolved away from “faster than a speeding bullet; more powerful than a locomotive; able to leap tall buildings in a single bound” into the almost godlike power-set with which we’re more familiar. For my money, the Batman who was the world’s foremost investigator and inventor — and a reasonably functional human being — is infinitely more interesting than the twisted, tortured, bloodthirsty antihero he is now. In an effort to reconnect with the more human (and more humane) side of the Dark Knight, today’s dynamic duo of artworks depicts Batman paired with his longtime nemesis-slash-paramour Selina Kyle, better known to the world as Catwoman. The piece at the top of the post features the pencils of former Supergirl artist Ron Adrian, embellished by his fellow Brazilian, Di Amorim. The scene in the center was penciled by the late, lamented Al Rio, with inks by the thankfully neither late nor lamented Geof Isherwood. Categories: Comic Art Friday, Hero of the Day, Reminiscing, SwanStuff, Taking Umbrage, That's Cool! Once upon a time (let’s call it the early 1970s), there was an anime series entitled Science Ninja Team Gatchaman (Kagaku Ninjatai Gatchaman in the original Japanese) about a five-member team of young superheroes-slash-ninja who dressed in costumes representing various birds. When ported over to the English-speaking marketplace in 1978, this series — in highly edited and rescripted form — became known as Battle of the Planets. Years later, the series was again recrafted for the West as G-Force: Guardians of Space. Still later — because Western packagers could never leave well enough alone — the show was retooled once more, this time as Eagle Riders. In all iterations, her primary fighting tool was a yo-yo. You did know that before it was marketed as a toy, the yo-yo was a Filipino weapon, yes? So the next time you yo-yo — y’know, like you do — you can thank the Ilocano people, not Mr. Duncan. Or Tommy Smothers. Still confused? I must be telling the story correctly, then. I first discovered Gatchaman in the late ’70s under the Battle of the Planets banner, so the young heroine depicted above by artist Iago Maia will always be Princess to me. But if you want to call her Jun, or Agatha June, or even Kelly, I won’t argue. Just don’t call her anything but awesome. Categories: Comic Art Friday, Hero of the Day, Reminiscing, SwanStuff, Teleholics Anonymous, That's Cool!